In an era of careful consumption and so-called “Eco fashion”, ethics and respect for nature are the watchwords for ways of dressing and thinking. A new approach that comes from being aware that it is possible to protect the future of the planet, also when it comes to quality fabrics. Carvico, global leader in the manufacturing on warp-knitted stretch fabrics, which has always moved in this direction by making sustainable, low environmental-impact production choices, has brilliantly met the eco-textile industry’s latest challenge with Sequoia. A brand new warp-knitted fabric made with Nurel Reco nylon, the recycled polyamide yarn which comes from industrial waste that is completely reconverted and transformed into new raw material. 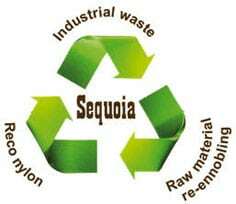 Sequoia can rightfully claim to be an eco-compatible fabric. Thanks to advanced research and the use of state-of-the-art technological tools, raw material waste produced during industrial processes is recovered and re-ennobled, to be transformed into Reco nylon – a high quality standard polyamide yarn. This recycling process dramatically reduces the consumption of raw materials. Reco nylon doesn’t use new natural resources, but recycled polyamide within a closed system. Every 1.000 kg of Reco nylon reduces atmospheric CO2 emissions by 1.424 kg, equivalent to the CO2 emission of a lit light bulb during 401.500 hours, that means more than 45 years! Perfecting this innovative fabric was a demanding challenge for Carvico, which led to significant ethical and environmental results. From a technical point of view, the fabric’s high levels of quality and performance are an obligatory guarantee to ensure Sequoia’s reliability and versatility of use, from sportswear to swimwear. In fact, the presence of Xtra Life LYCRA® provides an excellent chlorine resistance – up to 10 times better than standard elastane – high protection against degradation by UV rays (UPF 50+) and unsatured fatty acids of suntan lotions, as well as an outstanding fit. Lycra® Sport certification, awarded to the best performing fabrics for competitive sports, finally confirms its extraordinary elasticity and shape retention and ensures comfort and freedom of movement. Sequoia: an intelligent fabric that combines Carvico’s eco-sensitive philosophy with cutting-edge technological research, in order to respect the environment without doing away with quality and technical performance.